When I think summer, I think backyard barbeques. 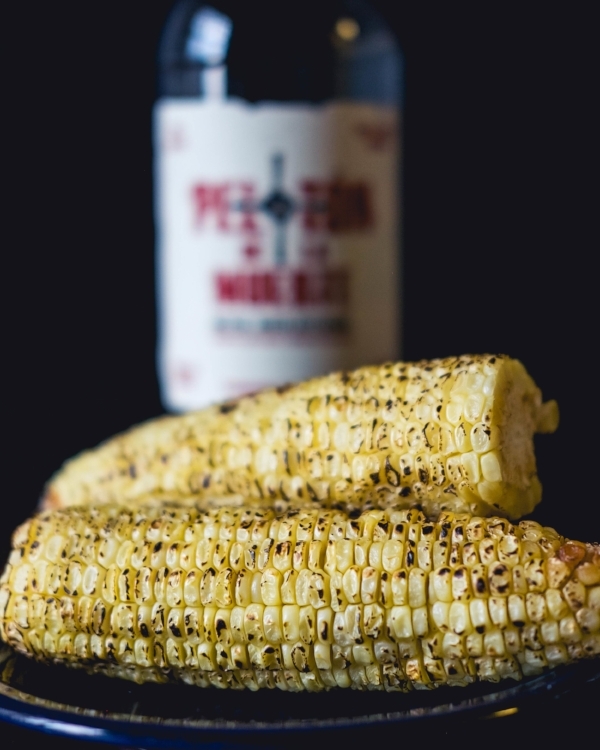 And what's a barbeque without corn on the cobb? Whilst brainstorming a corn cocktail I immediately thought to use Mezcal. I'm sure it'd also be great with Tequila, but I really wanted to utilize the smokiness of Mezcal. I chose to torch the corn because I felt that enhanced the corn's sweetness. Because of the sweetness of the corn, I kept the measurement of the honey syrup low. The goal was to keep all the flavors balanced and to complement the corn juice without overpowering it. I'm really proud of this drink. The combination makes for a refreshing and delectable drink. The perfect drink for those summer barbecues. Cheers! 1. Bake corn at 400 degrees for 25 minutes. 2. Torch until lightly charred. 3. Remove kernels from ear of corn. 4. Add corn and 1/2 cup of water per ear of corn. 5. Purée in blender or food processor. Awhile back I decided to play around with freezing edible flowers under ice. You've probably seen this on the web and Instagram, but I had never done this myself. I created my floral ice balls by placing edible flowers in an ice ball mold, then filling the mold with water. The results were so beautiful I couldn't wait to add my flower ice ball to a cocktail. But what cocktail? Every cocktail I thought of didn't do the flower ice ball justice. I finally decided to make one of my favorite cocktails, the "Last Word". Equal parts Gin, Green Chartreuse, Maraschino Liqueur, and Lime, the last word is a bright and sweet cocktail perfect for spring. There was only one problem. The traditional recipe made for a cloudy cocktail. If the star was the flower ice ball, I needed to reduce the drink's cloudiness. The solution? Milk washing. Milk washing is the process of adding milk to an acidic base. The resulting curdled milk is strained off to produce a "clear" and smooth drink removed of harsh flavors. I had never milk washed a cocktail before so I was super nervous. In addition to making a clear cocktail, I hoped that my milk wash would result in a cocktail that still tasted like a Last Word but less acidic. I couldn't have been more pleased with the results. The harsh acidity of the limes was muted while still maintaining that bright lime flavor. While the herbs of the chartreuse were still present, they didn't stand out over the other ingredients. Overall the beverage was sweet and smooth. Almost a little too sweet. So I decided to add more gin at the end in hopes of adding some dryness. The only downside to the process was the tedious straining. I had to stop and change the cheesecloth a few times due to the build-up of milk solids. Still, I would be willing to try this process again with other cocktail recipes. There's something nice about relaxing with a bottled cocktail knowing that all the work has been done. Combine alcohol and juice. Set aside. In a small pot, warm whole milk. Remove from heat before boiling. Strain the curdled liquid through a chinois or mesh strainer lined with cheesecloth. Add 1.5 ounces dry gin. Refrigerate. Strain again if desired. A few years ago my husband and I decided to spend Christmas in Key West. It was the best decision we ever made. It was the perfect trip. We smoked cigars by the water. We spent an entire afternoon fishing. We watched sunset after sunset. Key West has become our happy place. Reminiscing about that week has almost become a form of meditation. We take deep breaths and recall how we impressed our boat captain with our mad fishing skills. We think back to sunsets in Mallory Square, the hilarious Cat Guy, the sound of the waves crashing outside our hotel room. 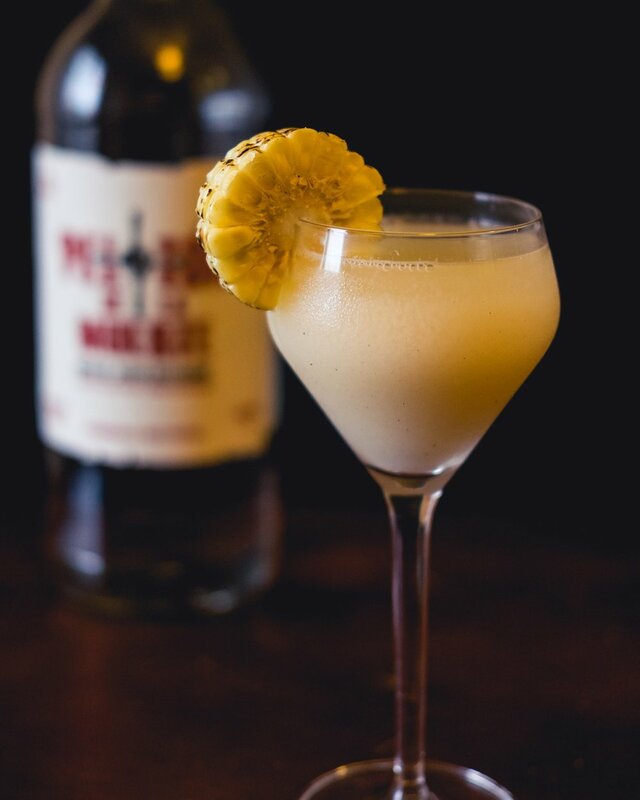 If Key West is our happy place, the Hemingway Daiquiri is our happy drink. Less sweet than the traditional daiquiri, the Hemingway Daiquiri substitutes the simple syrup with grapefruit juice and maraschino liqueur. It was invented at the El Floridita Bar in Havana, Cuba. And named after the bar’s most famous patron. I recently ran into an Instagram follower who made the comment “I wish I had the money to make the cocktails you make.” Let me let you in on a little secret of mine. I’m a low budget boozer. One: Use as few ingredients as possible. Enter the classics. Most old school recipes only have 3-4 ingredients (including citrus). Two: Find different ways to use the same spirit. For instance this past month I’ve been sticking to gin. I’m basically making as many different cocktails as I can using gin as the main ingredient. When the bottle is gone I move on to the next spirit. Three: I stopped buying things just to try them. Instead I look out for them at bars and ask for a taste. If I like it, I’ll ask the bartender to suggest a drink using that product. Only if I really think I’ll get some use out of it will I purchase it for home. Four: I remember to store low percentage (less than 30% abv) liqueurs and vermouth in the fridge. Chilling them helps them last longer and keeps the flavor from “turning”. The longer they last the less frequent I have to buy them. While I miss the days that I would buy booze with total abandon, it’s nice to know that I don’t have to break the bank whenever I want to make a cocktail at home. This post is sponsored by Bacardi Añejo Cuatro. The thoughts and recipe are my own. I’ve always thought of myself as a whiskey girl. I've never been shy about it. But I feel that it's time for me to start seeing other spirits. And I’m starting with Rum. I admit that I've never truly given rum a chance. In the past, whenever I’ve thought to make a rum cocktail my mind immediately went to a mojito or daiquiri. But I’ve decided that if I’m going to truly accept Rum into my life, I need to break with tradition. I was recently given a chance to sample Bacardi Añejo Cuatro, a blend of rums aged in American Oak for a minimum of 4 years. Just in time for my booze renaissance. I decided to approach this aged rum as I would any whiskey. The Añejo Cuatro greets you with a golden brown hue and medium body. First taste is full of deep cherry and fruit flavors with a long woody finish. I decided to play on those fruit flavors and pair the Añejo Cuatro with Luxardo Maraschino liqueur. Combine ingredients in an ice-filled shaker. I'm excited to see where my journey to explore other spirits takes me. So far, I think I'm off to a good start. 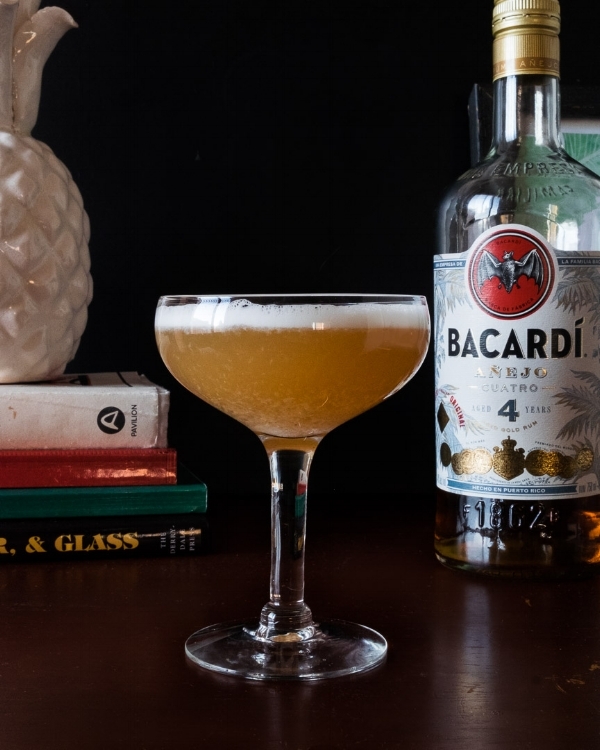 For more rum cocktails, check out my FANCY RUM COCKTAIL featuring Bacardi Añejo Cuatro and sparkling wine. Don't mind me. I'm just sitting here still waiting for our first real snow storm. Until then, I'm stocking up on winter cocktail recipes. 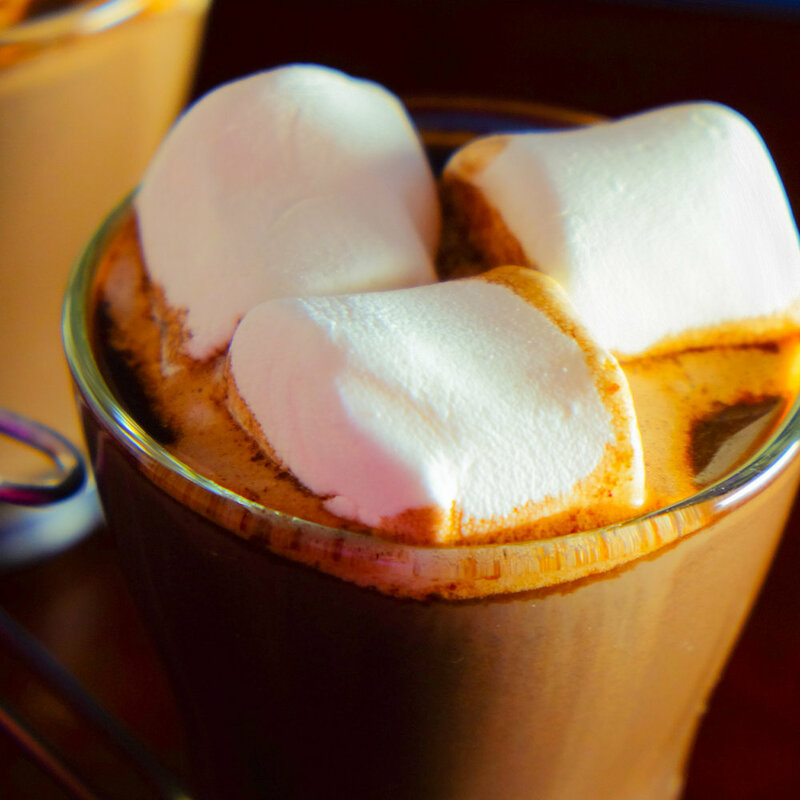 I have my favorite Chartreuse Hot Chocolate and Hot Toddy recipes. Now, it's time for a classic twist. The Negroni is one of my favorite cocktails that I don't have a lot. I'm afraid that if I order it all the time, I'll grow tired of it and it'll stop being a favorite. Recently I decided to revisit my old friend and it was just as good as the first time. But I always associate the Negroni with spring. Possibly because of its use of gin and it's bright flavor. So, I felt it was time to "winterize" my Negroni. I love infusing spirits with baking spices. But I couldn't bring myself to infuse my gin with cinnamon and cloves. How often was I going to use this spiced infused gin? So, naturally, my brain turned to the vermouth. I could infuse sweet vermouth with baking spices, I thought. Then it dawned on me that what I really wanted was a Mulled Wine. Allow to cool before straining. I love how simple and delicious this mulled wine is and couldn't wait to try it in my Winter Negroni. As for my choice of gin. I made sure to avoid any overly floral gins. I didn't want the floral flavors to compete with the baking spices. I've tried this recipe several times and found that a citrus forward gin like the Scottish Caorunn or a simple gin like Bar Hill works best. If you're familiar with the Negroni recipe you may also notice, that my recipe isn't in equal parts. That's due to the oranges I infused in my mulled wine. I found that taking the Campari down a step resulted in a more well-rounded cocktail. Whereas, keeping the Campari at one ounce made the cocktail slightly too bitter. Could I have gone back and omitted the oranges from my mulled wine? Yes. But I like my Mulled Wine a lot and I didn't want to tamper with it. In a mixing glass, combine ingredients with ice. So that's my Winter Negroni. I'm crossing my fingers for a snow day. How awesome would that Winter Negroni look tucked into a bed of snow? Ah, the common cold. According to the CDC, the average adult can expect to have 2-3 colds a year. Lasting an average of 7-10 days, it can feel like it can take forever to recover. 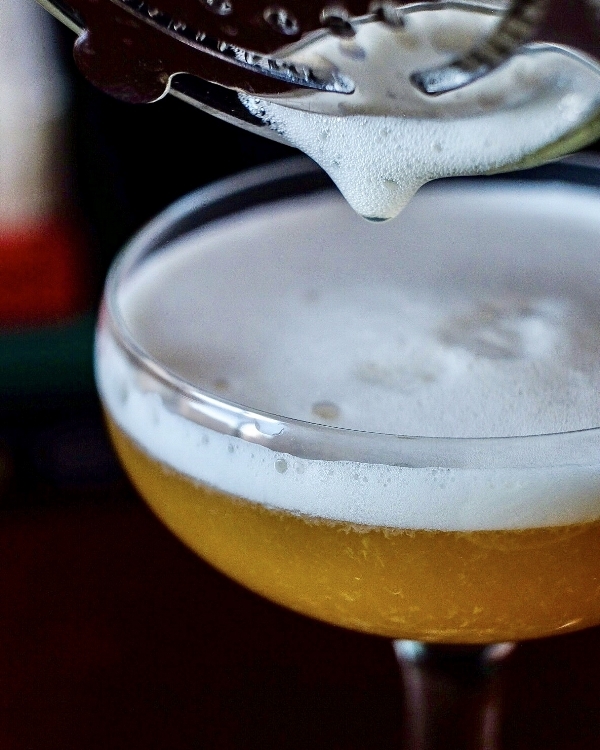 You could wander the medicine aisle looking for a cure-all, or you can kick that cold with the help of a simple cocktail. 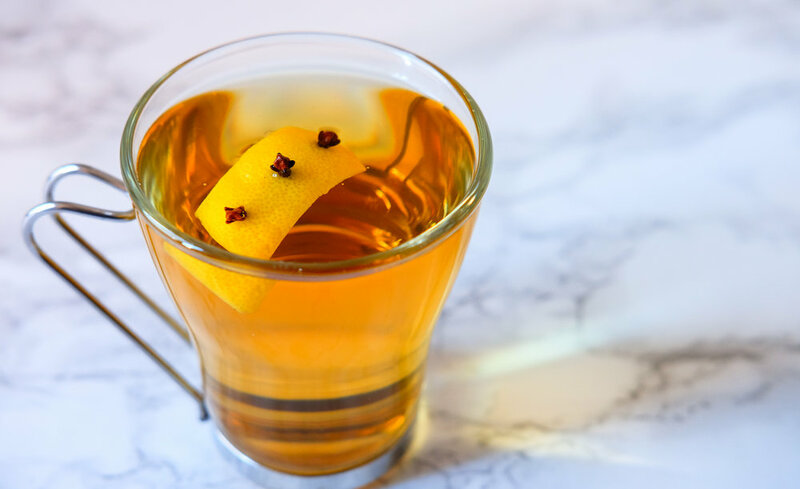 The Hot Toddy is as easy as it gets. Whiskey, honey, and lemon are combined with boiling water for the ultimate comfort drink. You may have heard that the Toddy can serve as a cold remedy. There's actually some truth to this old wives’ tale. The three major elements of the Hot Toddy each have healing properties. Rich in Vitamin C, lemon boosts the immune system. The acid in lemon juice cuts through mucus and relieves congestion. Lemon also aides the liver in cleansing the body, helping you to kick that pesky cold. The anti-bacterial properties in honey are wildly known. Honey has been used to treat wounds and prevent infections. It can serve as an antibiotic, resistant to some strains of bacteria. Honey can also serve as a cough suppressant. Studies have shown that a teaspoon of honey at bedtime can reduce coughing helping to improve sleep. Whiskey is also an antiseptic, reducing the possibility of infection. And as a numbing agent, whiskey - combined with honey - can soothe that tender sore throat. So the next time you feel a cold coming on, take a sick day, rest, and relax with a Hot Toddy (or two). You'll be back to work sooner than you think. Combine ingredients in a heat-resistant glass or mug. Every now and then I come across a product that is not only good tasting but also good for the soul. So is the case when I got the chance to try Amarula Cream. 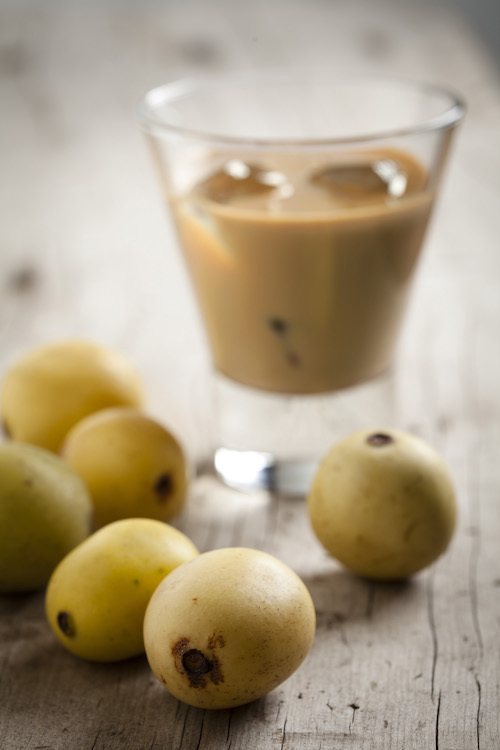 Amarula Cream is made from the fruit of Marula trees that grow across Africa's subequatorial plains. The fruit, roughly the size of a plum, has a creamy, nutty taste and contains more vitamin C than the average orange. Amarula Cream reflects the fruit's nutty flavor. While delicious on it's own, it's a perfect compliment to coffee. It's my absolute favorite way to enjoy Amarula Cream. 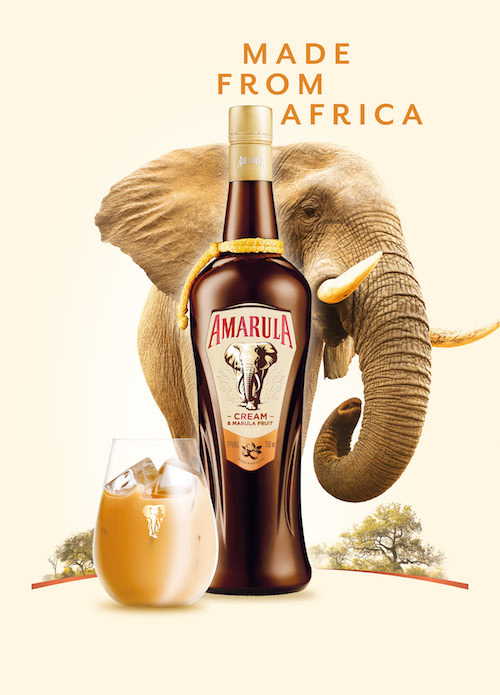 What drew me to the liquor was Amarula's commitment to protecting African Elephants. The Amarula trust aides in finding ways the elephants can share limited resources with their neighbors - the people of Botswana. The trust funds a program known as Ecoexist (partnered with Texas A&M University) that monitors the elephant population and migration in hopes of developing strategies to limit conflict between elephants and people. The Amarula trust also aides in job creation in eco-tourism in Southern Africa. The Trust funds an Eco-Training project that allows students to undergo a month long training course to become field guides in Namibia. The Namibian tourism industry is a fast growing industry and accounted for 14.9% of the gross domestic product in 2015. As the industry increases so does the need for skilled field guides. Give Amarula Cream a try in your coffee or over ice and help support a worthly cause! A sample of Cruzan Tropical Fruit Rum was provided for this post. Invented in the 17th century by sailors for the British East India Company, the word punch is derived from the Sanskrit word “panch,” meaning “five.” A traditional punch is made with just five ingredients - alcohol, water, sugar, citrus, and spice. Nowadays, when you think of punch you probably think fruity and sweet. But there's more to punch than fruit juice and sugar. We're taking a look at the 5 rules to making a proper punch. Always use fresh fruits! Put down that can and start chopping. Fresh fruits provide brighter flavor and delicious all-natural sugars. Too much dilution can kill even the best recipe. When serving punch, use larger blocks of ice. If using a punch bowl to serve, try freezing your ice in a large Tupperware container with fruits. Once frozen, add the ice to punch bowl and top with your punch. Punch is best served chilled. Chill your punch at least 4 to 6 hours (without ice) before serving. Get creative. Experiment with different spirits and fruits. Try adding spices - like nutmeg, cinnamon, cloves - or teas to your punch. Have fun with it! Share with friends. The beauty of punch is that it's communal. It's meant to be shared and enjoyed by many. I decided to get a little crafty with my own punch recipe. I incorporated tea by infusing white tea in dry vermouth. To add citrus, I made an oleo saccharum in lieu of using traditional juice. The combination created a refreshing punch bursting with citrus flavor. For my spirit, I used Cruzan Tropical Fruit Rum. Because this rum has a touch of sweetness, I held back on the amount of syrup I used in my punch. Remove zest of limes and oranges, careful to avoid the white pith. In an airtight container, muddle peels with sugar. Allow to sit for 24 hours. Strain oil into an airtight container. Press peels to release more oil before discarding. To make tea-infused vermouth, soak 2 tea bags for every 6 ounces of dry vermouth overnight. Strain through a wire mesh strainer to remove any tea particles. Large batch: Combine ingredients and allow to chill. Add to pitcher or bowl and stir with ice. Single Serving: Combine ingredients in a shaker. Shake with ice. Strain into a chilled coupe glass.